A good travel won’t be complete without good food to fill your tummy and satisfy your cravings. Here are the most recommended restaurants in Bolinao Pangasinan, Sungayan floating grill and Giant Taklobo. A whole day of exploring the beauty of Hundred Island in Alaminos, Pangasinan was so much fun yet really tiring and starving. After we checked in our Accommodation in Bolinao, we then washed up and prepared for dinner. 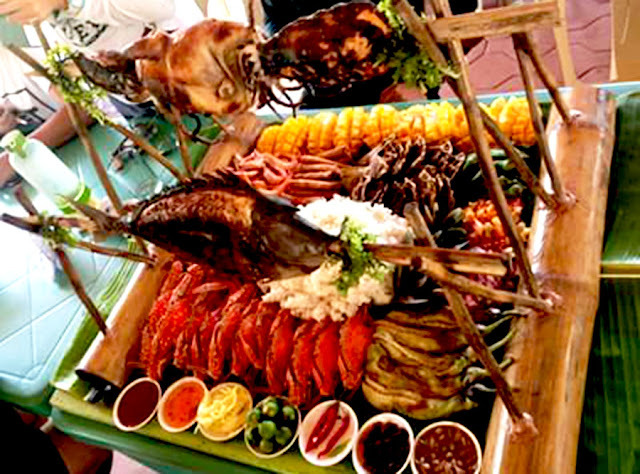 I actually do not have any idea what is the must eat food in Pangasinan specifically in Bolinao. Good thing, Kuya Kiko of MK Compass Travel and Tours brought us to Sungayan Grill. 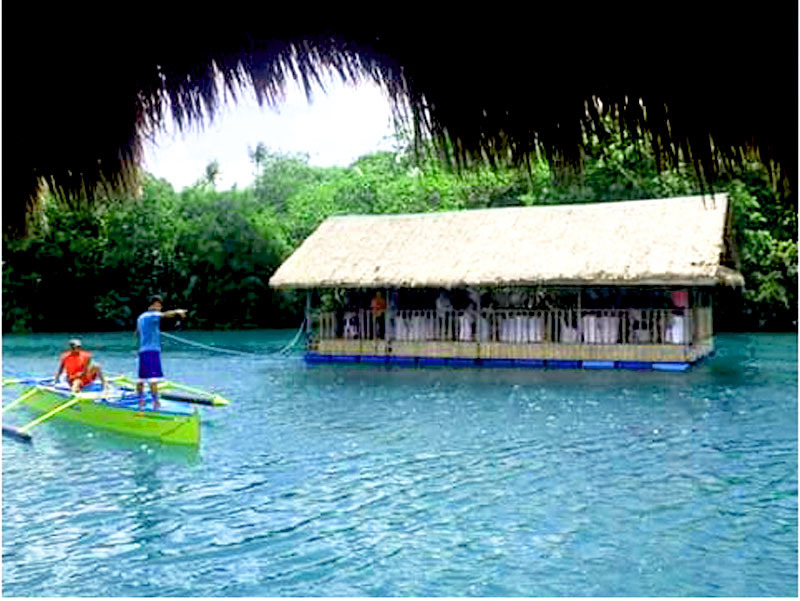 This is a floating restaurant in Balingasay River, one of the cleanest rivers in the country. 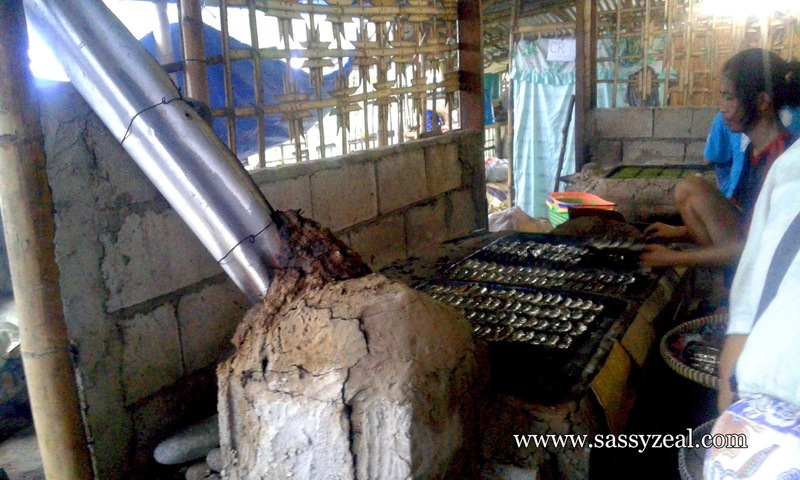 Sungayan Grill is in an inner area which is not so easy to find. 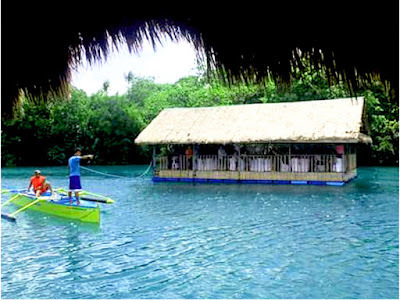 This is a native floating restaurant which has bamboo and hand crafted interior and exterior. Tables and chairs are bamboos as well. The ambiance is cool as it is open air. The food is good and very affordable. Sulit! OMG, due to extreme starvation, I forgot to take pictures of the food. We only have groupie and after dinner pictures. We ordered sinigang, sisig and I love the Sisig so much. Well cooked and very tasty. How about dinning here with the group? No problem! It will cost you and your friends less with the Fiesta Bilao Set. Seafood feast. The next day, we had lunch at Giant Taklobo, one of the most recommended restaurant in Bolinao. If you would notice the similarity between Sungayan and Giant taklobo like the food set or menu/ the ambiance and service, well don’t be surprise because with our small talk with the owner of Giant taklobo, she have mentioned that the owner of the Sungayan is actually her Niece. Hmm good to know! 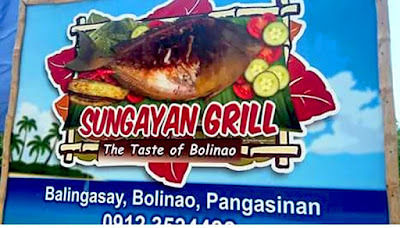 Another version of Sungayan Floating Grill is Giant Taklobo Restaurant. 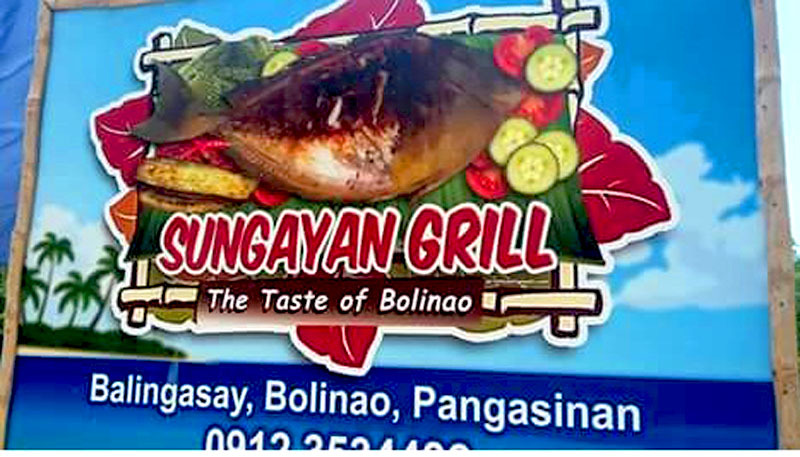 One of the most recommended restaurant to dine in Bolinao, Pangasinan. We had lunch here on our last day in Pangasinan, Saving the best for last! Giant Taklobo Restaurant owns a very wide property covering the nipa huts along the fence of the Giant Taklobo property, the ample parking area and Pavilions for huge number of dinners. The ambiance is very close to nature which is so relaxing, comfortable and cool. The only thing that bothers me is one fly that keep on targeting our food. They provided us a table candle which kept away the fly. The Pavilion is open which allows the natural air to come in. You can stay either in any of the Nipa Hut in row or in the open Pavilion with TV. Good service indeed! They greeted us upon arrival. Staffs are courteous and nice. Offered us complimentary nuts, water and provided us the menu. They also went to our table just to tell us that wifi is available given the password. 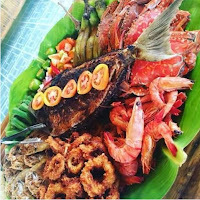 Serving time is just enough to cook fresh seafood, side veggies and meat. Freshly cooked food! Specially the seafood. 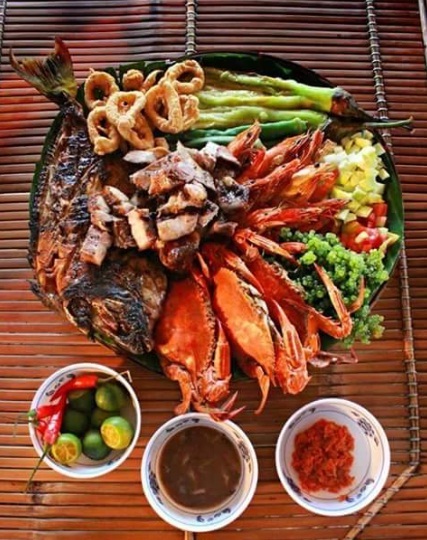 We ordered Mixed Bilao comprises of combination of meat and seafood with veggies on the side. Perfect for a group! We are four in a group but this seems to be much for us. 1 Platter of Rice, and a FREE Pitcher of Iced Tea Grilled Bangus or Grilled Sungayan, Calamares, Danggit, Grilled Liempo or Pork Barbeque on Stick, Chicken, Steamed Crabs, Steamed Okra, Grilled Eggplant, Green Mango or Pickled Mango, Atchara, Arosep, Tomato, Alamang and Padas, 1 Platter of Rice, and a FREE Pitcher of Iced Tea. 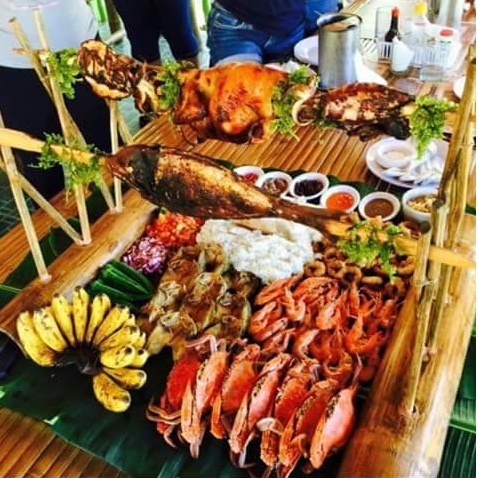 You can choose from Small (3-5pax) 1300php, Medium and Large Bilao (8-10pax) 1800php. 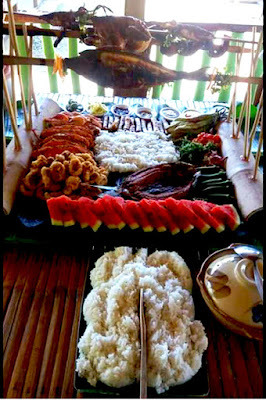 The size of our bilao is Medium good for 5-8 pax, price is 1500php. MUST TRY! Freshly cooked Sungayan Fish. MUST EAT DELICACIES OF PANGASINAN! Tupig! 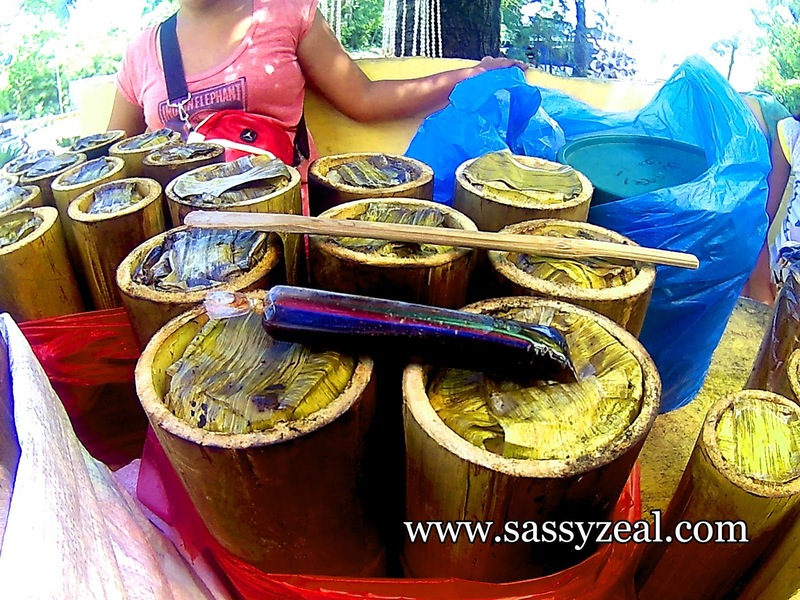 Made of ground glutinous rice and coconut strip wrapped in banana leaves. this is a popular Pangasinan delicacy. 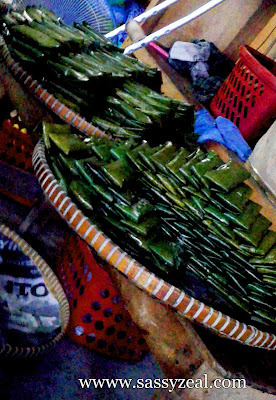 It looks like "suman" but the difference is its a rice mixed with coconut and sugar that made it sweet. Crunchy and best eaten when hot. 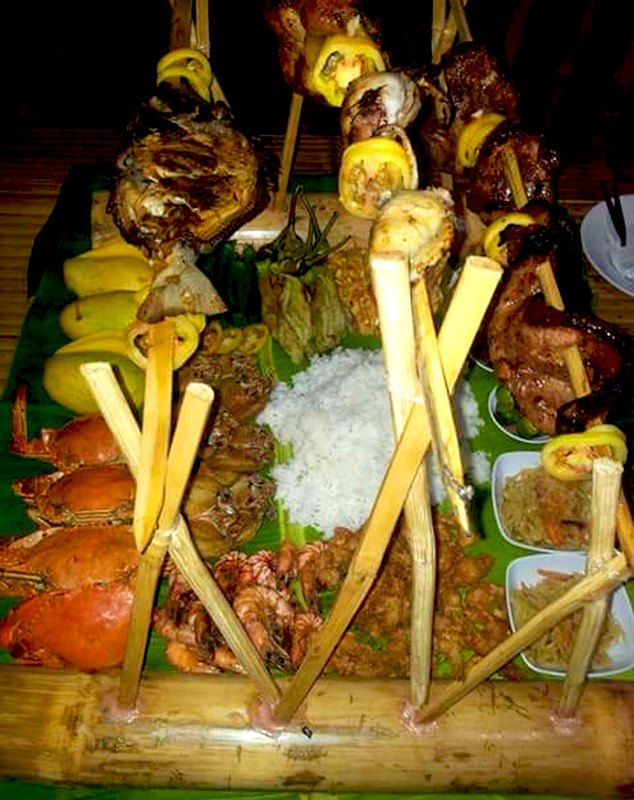 Cooked over charcoal or "ihaw" (grilled). 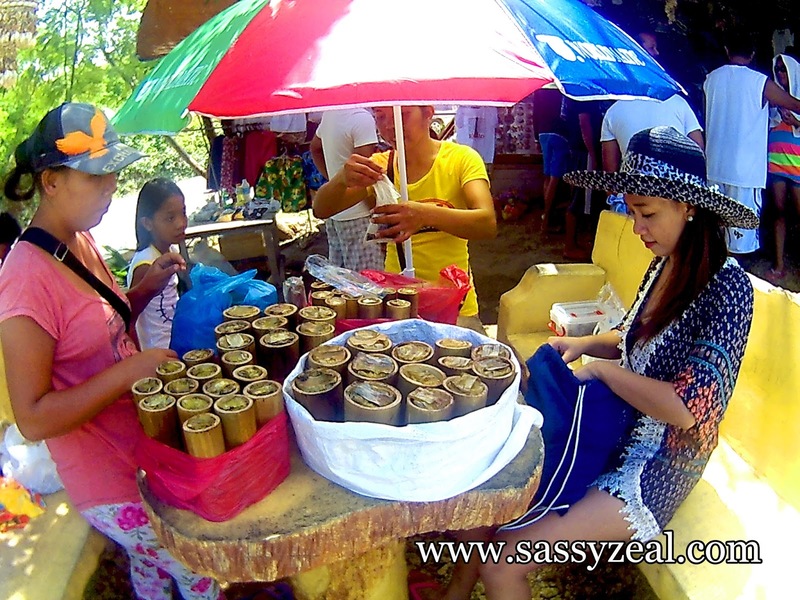 In a store along the road of Bolinao, this is the traditional mass production of tupig.